A festive, fully-staged holiday celebration rich with color and pageantry, by the acclaimed Washington Revels company of nearly 100 performers, ages 8-84. Eight performances, December 8-9 & 14-16 (matinees and evenings), at the George Washington Lisner Auditorium, 21st and H Streets NW, Washington DC. View the full schedule of performances (including ticket-buying options), or online now! 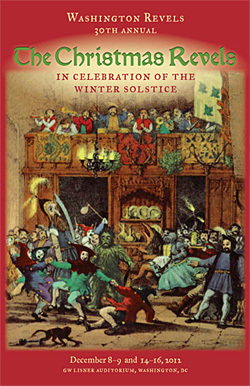 For our 30th annual celebration of the Winter Solstice, we call upon well-loved elements of Christmas Revels past to renew the spirit of joy that marks this time of the year. England’s Haddon Hall (the iconic setting of early productions in all Revels cities) is the perfect backdrop for the traditional and early music, dance and drama of Britain and Europe -- the same material that inspired national founder John Langstaff's very first Christmas Revels in 1957. We begin the story in 1929, as businessman John Manners, 9th Duke of Rutland, is giving his family a last look at the once-great Haddon Hall before he sells the rundown estate to build a new modern motorway. There he discovers the 'spirits'-- his ancestral Dukes and Duchesses, Earls and Countesses, and local Derbyshire country folk-- who reconvene each year to ring in the season with boisterous winter revelry. Their efforts to save their legacy (and our own!) will feature favorite Revels sing-alongs, a madcap “Twelve Days of Christmas,” new music of the season, lively country and Morris dancing, the mysterious Abbots Bromley Horn Dance, a delightful Mummer’s play with a surprise ending, and a special Revels evocation of Dickens' A Christmas Carol that will touch the heart. Our cast of nearly 100 musicians and actors, ages 8-84, includes treasured professional artists from the last three decades of Christmas Revels in Washington. Help us spread the word! Download copies of our Handbill, Ticket Flyer, and Poster as PDF files suitable for emailing to your friends!